Creating a successful app for food delivery can be quite a challenging process. Such an app should perform excellently both for consumers and restaurant owners. What's more, it must somehow operate the delivery process. Indeed, there are many factors to keep in mind when creating one. But don’t worry! In our article, we will guide you through all the details of food delivery app development. You may ask: "Why do I need to design an app for food delivery at all? There are many successful applications on the market, so why do I need to spend my time and money developing yet another one?" The reasons are quite simple. Firstly, there is an existing big food delivery market with impressive growth potential. It means that people are interested in such services and use them on a regular basis. Your product will not be outdated or unknown to customers; therefore, it will be in demand. This market is growing – so it is the perfect time for you to join the competition. Furthermore, you will get access to a wide customer base. Many active smartphone users regularly buy dishes via apps. Young people, office workers, families with small children, etc. will definitely become your potential customers. You will have a stable amount of orders. That is a great way to gain popularity even for a young app development company. Since there are many successful apps in the niche of food delivery, you can easily learn from their experience. There is no need to create a clone of an existing service; however, you can borrow some ideas. So, let's study the most popular apps on the market. UberEats is one of the most popular food ordering services worldwide. It covers more than 1,000 major cities around the world. So, what is the key to its success? UberEats provides a very convenient service. A customer can choose food items from their favorite restaurants, and freelance drivers will deliver their order as fast as possible. UberEats collaborates with a wide range of restaurants, so every customer can order what they want. What is more, the app is easy to use. You can order a lunch in just a few taps. It can even send you a notification in case you lose track of time and forget about the order. This app, naturally, supports cashless transactions and allows you to track your delivery. 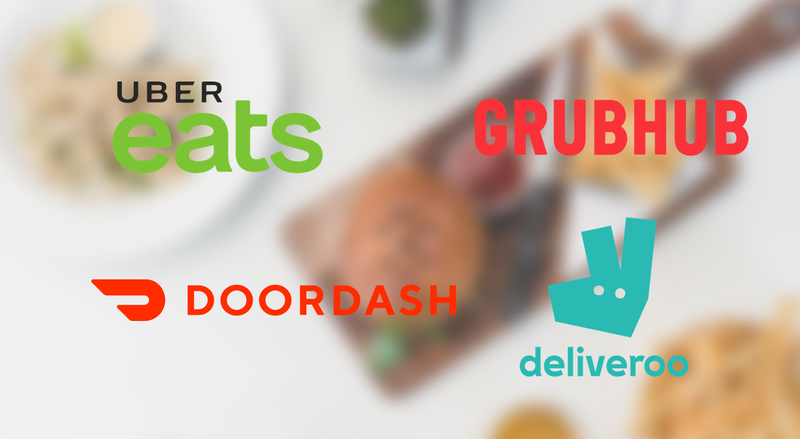 GrubHub is a food delivery platform with a long history (it was launched back in 2004). It connects restaurants with users, while independent contractors provide delivery services. Another great feature GrubHub provides is a good search possibilities with numerous filters. You can search by cuisine, customer feedback or by closest restaurants to find your perfect dish. This application provides you with the opportunity to customize a list of favorites, so there is no need to search for them every time. It is very convenient for regular customers. Furthermore, GrubHub has 24/7 service teams who manage orders and support customers. Another service in this industry, Deliveroo offers you the possibility to order food from restaurants without its own delivery system. This app has gained popularity thanks to its quick delivery service. Its well-planned coupon system also engages people to use Deliveroo. This app has a limited delivery radius to make logistics as simple as possible. It has one particular feature: Deliveroo supports bicycle-, motorcycle- and car-based transport options. It engages more people in the delivery system, and at the same time makes services faster. Zomato is another popular app for food delivery. It is a combination of a food delivery service with features of a social network for foodies. On one hand, it provides an excellent food delivery service. What is more, Zomato offers a list of the best restaurants and even enables you to book a table in a few taps. On the other hand, it works as a social network for people interested in food. You will get familiar options to follow other users, read reviews and feedback, and explore nearby restaurants. What is more, this service allows getting special offers like social drinking membership after the subscription (Zomato Gold). Last but not least, DoorDash is one more successful food delivery app, which was launched in 2013. It is available in dozens of North American cities. This app limits the distance range to assure that people will get their orders quickly. Moreover, it is beneficial for smaller local restaurants and encourages competition. DoorDash supports different search categories, such as the closest restaurant or fastest delivery. After you place an order, it can be tracked via this app. Another great feature is a reorder option, which is amazing if you have already found your favorite dishes. If you want to create your own app for food delivery, don’t reinvent the wheel. Such applications provide a platform to connect customers and restaurants. They accept the orders and pass them to restaurants. However, the application doesn't control the delivery process. That process is entirely the restaurant's responsibility. That is the reason why only big restaurants with their own delivery systems can use this app. In addition to the previous features, this model supports the delivery system. Such a platform involves third-party delivery personnel, who pick up prepared orders from restaurants and bring them to customers. Therefore, such a model has more extensive market potential. It covers even small restaurants that don't have their own delivery services. To sum up, the aggregator apps are a little bit outdated now, because a platform with logistic support is more convenient for both consumers and restaurants. Therefore, if you want to know how to make an app like UberEats, you need to focus on the second model. You may be still wondering how to develop a food delivery app. Well, for one thing, it should provide a great experience for all users (customers, carriers and restaurants). Here, you have several options. The first one is to create one app with three separate logins. It will give access to a different interface for each consumer, restaurant manager or delivery person. Another solution is to develop three apps. Each of them will fulfill the needs of a specific category of users. You can also duplicate a restaurant app's functionality in web format. It would be way more convenient to configure listings, products, etc. with the help of a separate admin panel available via any browser. Regardless of which tactics you choose for your business, you should keep in mind that it must be functional for each stakeholder. A detailed description of restaurants and meals – it is necessary to provide customers with clear information about dishes and their composition. Order placement – this process should be quick and simple. What is more, the app should provide an option to specify the content of any meal. People may have different food preferences and intolerances, so offer them the possibility to customize a dish. Custom search tool – an essential component of any food ordering app. A list of search categories and options to customize will make the ordering process much more comfortable. Geolocation – a useful feature for both customers and delivery staff. It helps customers to find nearby restaurants and at the same time makes the logistic system clearer for carriers. Built-in tracker – every customer wants to control the delivery process, so you must provide this option. Moreover, such information is also useful for restaurants, because it helps them analyze the process of preparation. Multiple payment solutions – keep in mind that people can have preferences for payment systems as well, so your app must provide several options (online payment options or cash). Feedback – people must be able to write a review about the restaurant or the dish. It helps to find weak points in your services. Notifications (SMS, push) – another vital feature of any successful app. Notify your customers about the status of their order, tell them about discounts, and remind them to order a dinner if they are busy. Integration with social networks – people like to share their experience with others, so give them the ability to do so. In return, you will gain more popularity and widen your audience. Reward programs – incentives such as loyalty systems, discounts and coupons will bring more customers to your business. Cross-interface possibilities – this is essential for both restaurant managers and couriers. The app should provide a functionality to operate orders, update information and communicate with other stakeholders. Order history/ analytics – any person should have the ability to check previous orders. The reorder option here can be very convenient. At the same time, restaurants must have access to the order history, because it is crucial data for analytics. Here, we described the most vital features for a food delivery platform. Your food delivery app can (and must) have some other functions, which will make it unique. Another question that is closely familiar for every startup owner: "How much money this app will require?" The cost of making a food delivery app may vary depending on several factors. The first one is the extent of functionality. A straightforward platform with few tools will surely be cheaper. However, if you want your app to provide a wide range of functions, the price of building it will increase. Another factor is the mobile platform: iOS or Android. Furthermore, the design can also influence the total cost of an app. Complex design ideas will lead to a higher price. That’s why the cost of an app will be different in each particular case. However, we can make some general assumptions on the price. Let’s estimate the cost of making a food delivery app with three different interfaces. The customer part of the app is more complicated, so it will take at least 400 hours to develop. The restaurant part of the app can have a simpler design, therefore it will require about 350 hours. The courier part of the app usually has fewer features; therefore, about 160 hours should be enough for its development. Then comes the backend along with the admin panel, which will require about 350-400 hours to finish up. As result, we will have about 910 hours of work. The minimal hourly cost of development can vary from $20-50 (for developing countries such as India) to $50-150 (for American or European developers). Therefore, the development of a food delivery app will require around $25-75k of investment. Another critical stage besides app development is marketing. Remember that you will have a lot of competitors. Therefore, you should make your services familiar and unique to customers at the same time. Firstly, target the right audience. Whether your business focuses on delivering fast food, vegan meals or exotic cuisine, it should provide its services to the right people. Understanding your audience and targeting potential customers will result in an effective advertising campaign. Consider using all possibilities for app promotion, including social networks – they can be an excellent opportunity for expanding your customer base. Use loyalty programs to keep old customers using your app. The same principle can be used for couriers to encourage them to continue to work for you. Finally, pay attention when choosing restaurants and delivery partners. They can become a base for your success – or lead to the ruin of your business. It is better to start with fewer trusted partners to ensure that you can provide your services at a high level. At this point, you know all the details about food delivery app development, the list of features and the project stages as well as the approximate cost of food delivery app development. We hope that our material will help you to create a great app and build a successful business in the food delivery niche. If you wish to get a professional estimate of your particular app idea, do not hesitate to contact us, we'll be happy to discuss your project! We hope you enjoyed this article! It's very important for us to receive your feedback. You can use these emojis to describe your feelings.